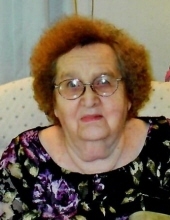 Evelyn F. Sampson, 91, of Herrin, died 11:48 p.m. Sunday, February 3, 2019 at Shawnee Christian Nursing Center in Herrin. Evelyn was a homemaker and a member of the Herrin Free Methodist Church. Evelyn was born April 24, 1927 in Harrisburg, IL to Edward Elmo and Estelle Leah (Sharp) Sullivan. Evelyn was united in marriage with Donald Edwin “Don” Sampson on May 19, 1946 in Chicago, IL. He preceded her in death on January 16, 1994. Surviving are three daughters and one son-in-law, Donna June Young of West Frankfort, Sandra and Neal Hamilton of Paducah, KY, Merna Borders of Herrin; son, Dale Allen Sampson of Plumfield; twenty grandchildren; many great grandchildren; sister, Deanna Young of Johnston City and several nieces and nephews. She was preceded in death by her husband, daughter, Brenda Harvey in 1987, son, Howard Lee Sampson, daughter-in-law, Pamela Sampson, grandson, Gabe Grisley, brother, Edward Lee Sullivan, parents and a sister, Norma Faro. Services will be 1:00 p.m. Wednesday, February 6, 2019 at Meredith-Waddell Funeral Home in Herrin with Rev. Glenn Sanders officiating. Visitation will be from 11:00 a.m. until 1:00 p.m. Wednesday at the funeral home. Interment will be in Herrin City Cemetery. Memorial donations are suggested and may be made to Alzheimer’s Association, 320 East Walnut, Suite A. Carbondale, IL 62901 or Hospice of Southern Illinois 204 Halfway Road, Marion, IL 62959; envelopes will be available at the funeral home. To send flowers or a remembrance gift to the family of Evelyn F. Sampson, please visit our Tribute Store. "Email Address" would like to share the life celebration of Evelyn F. Sampson. Click on the "link" to go to share a favorite memory or leave a condolence message for the family.